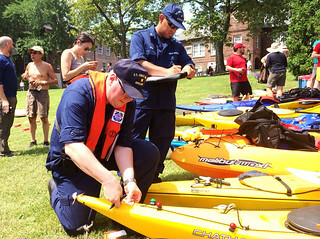 NEW YORK – The Coast Guard Auxiliary participated in the Metropolitan Waterfront Alliance’s (MWA) City of Water Day on Governors Island, July 12, 2014. MWA’s City of Water Day is the region’s premier harbor-wide event, held in various locations throughout New York and New Jersey’s metropolitan waterfront area. The festival, organized by MWA and its 700 alliance partners including the Coast Guard Auxiliary, is designed to reconnect the waterfront community while promoting educational activities and safety on the water. During the festival, members from the Auxiliary provided complimentary inspections on paddle craft brought to the island by paddle sport enthusiasts, and promoted recreational boating safety emphasizing the importance of always wearing a life jacket and being well prepared in case of an emergency. “We check to see if there is any seepage in the kayak and for Coast Guard approved life jackets, a strobe light or reflector and brief the individual on what to do if the kayak rolls over on the water and things like that,” said Coast Guard Auxiliarist Anthony Carter, the 05-03 Flotilla staff officer for vessel examinations. According to the Coast Guard’s 2013 Recreational Boating Statistics: there were 398 people who drowned, 93 of them were from kayak and canoe incidents. A vessel safety check for a kayak or canoe takes about five minutes to complete, and covers safety items and emergency procedures needed for a person to enjoy their paddle sport on the water safely. At this year’s City of Water event, members of the Auxiliary inspected 62 kayaks ensuring they were safe and ready for the water. For more information about vessel safety checks and recreational boating safety, visit www.uscgboating.org.